The Council agreed on Wednesday on setting stricter CO2 emission standards for new passenger cars and light commercial vehicles in the European Union (EU). The agreement means that the Austrian Presidency has the mandate to start negotiations with the European Parliament, which adopted its position on 3 October 2018. 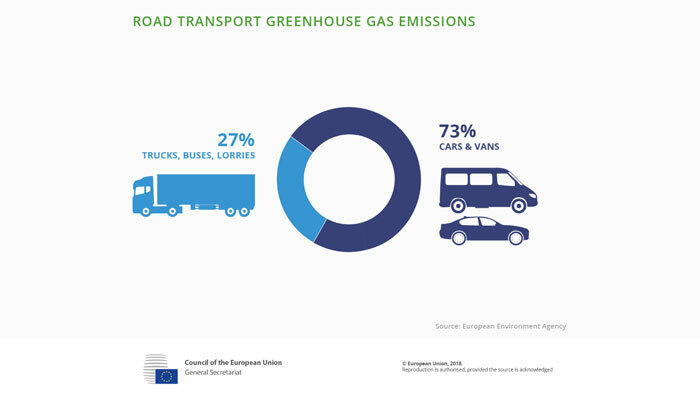 The Council agreed that average CO2 emissions of new passenger cars registered in the EU will have to be 15% lower in 2025 and 35% lower in 2030, compared to the emission limits valid in 2021. For vans, the Council maintains the targets as proposed by the European Commission: 15% in 2025 and 30% in 2030. These are EU wide fleet targets. The CO2 reduction effort will be distributed among manufacturers on the basis of the average mass of their vehicle fleet. The Council also agreed to adjust the EU Commission’s proposal on an incentive mechanism for zero- and low-emission vehicles (ZLEVs) such as fully electric cars or plug-in hybrid vehicles as regards passenger cars. The benchmark for cars for 2030 was raised to 35%. The Council decided to introduce a better weighting of low-emission vehicles in the incentive mechanism for ZLEVs. The Council also agreed on a specific incentive for manufacturers to sell zero- and low-emission cars in markets with a low market penetration of these vehicles. In concrete terms, there is a more favourable weighting for newly registered passenger cars in member states where the share of zero- and low-emission vehicles is below 60% of the EU average. For vans, the Council agreed to leave the Commission proposal unchanged. Under the new rules, car manufacturers will have to report more robust and more representative data concerning the emissions of cars and vans. The Council decided to strengthen the provisions by obliging manufacturers to report measured values instead of declared values. The calculation of targets will thus be based on measured WLTP (Worldwide harmonized Light vehicles Test Procedure) values. The WLTP is said to be a better test procedure than the New European Driving Cycle (NEDC), providing CO2 emission and fuel consumption values that are more representative of real-world conditions. The WLTP became mandatory for all new car models from September 2017 and for all new cars from September 2018. The EU Commission presented its proposal on the regulation in November 2017 as part of the clean mobility package. The proposal has been the subject of detailed negotiations in the Council Working Party on Environment before being submitted to ministers at the Environment Council on 9 October. The overall aim of the proposal is to contribute to achieving the goals of the Paris Agreement and to reaching the EU wide 30% reduction target by 2030 compared to 2005 of the non-ETS (Emissions Trading System) sector set by the European Commission, which is translated into national targets in the Effort Sharing Regulation. The proposed measures and targets are based on the 2030 climate and energy framework and with the energy union strategy, which aims at a reduction in transport emissions and energy consumption.